Beryl E. Organ, born in Bristol in 1928, has been fascinated by animals and flowers all her life. For many years she ran a modelling agency. In later life she took up writing and over the years she has produced a series of children’s books, all focusing on the natural world some in prose, some in verse. An accomplished artist, she also paints pictures of animals, birds and flowers, from pet dogs and cats to wild birds and butterflies. After publishing Tiggy’s World and Benjy’s Magic Mantle in 2010, Beryl has now completed Tales of Mr Winkle, the story of a garden gnome, and is working on three books of verse for children entitled Animal Antics, Our Woodland Friends and ABC of Flowers. 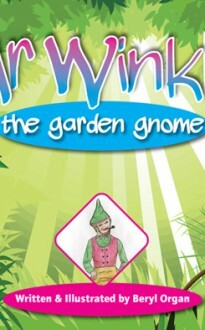 Tales of Mr Winkle is about an old garden gnome who watches the comings and goings of his many animal friends and neighbours from his seat beside the pond. When the winter nights start drawing in Mr Winkle is sad to watch the squirrels, frogs, hedgehogs and songbirds disappear until next spring, but he has many other visitors to keep him company, particularly his friend Rudi the Robin. He is soon joined by some unexpected friends to cheer him up.